INSTALL, the International Standards and Training Alliance, collaborated with nine industry-leading substrate and underlayment manufacturers on a Memorandum of Understanding (MOU). The MOU, signed at a special event at the International Training Center in Las Vegas, NV, on January 12, 2017, signifies a collective industry endorsement of INSTALL’s Substrate Prep Certification program. The program is a collaborative effort between INSTALL and its manufacturer partners. It requires that each manufacturer specify that the installer of their underlayment products be an INSTALL – certified installer or equal. After this, and the successful completion of manufacturer proprietary testing, the installation will be eligible for an extended product warranty. “This is the most important certification that INSTALL offers because it is the precursor to the installation of any floorcovering product,” said Mark Olsen, INSTALL instructor and member of the North Central States Regional Council of Carpenters. “If the substrate is not evaluated and prepared correctly, the installation of the finished floor will fail. The implementation of the program will solve a number of problems in the industry,” he added. 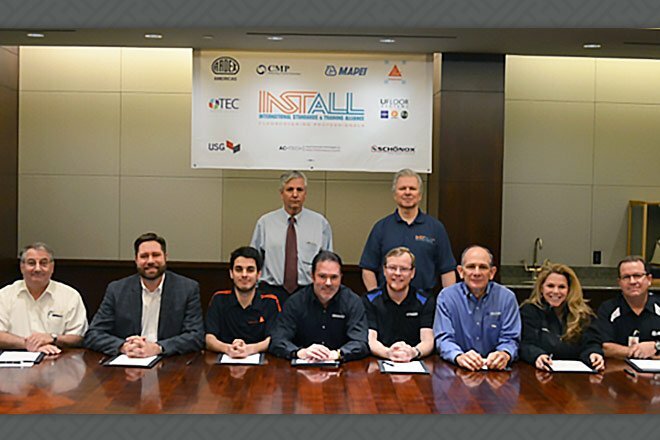 Finalized in early January, the INSTALL Substrate Prep Certification was developed using the same process adopted for INSTALL curriculum and other certifications – collaboration with industry subject matter experts representing installers, employers and manufacturers. UPDATE: In addition to the underlayment manufacturers noted above – those signing the MOU in January 2017 – INSTALL is proud to announce that Laticrete has also joined the memorandum of understanding to endorse specification of the Substrate Prep Certification. Get more details on Laticrete’s endorsement here.